I love blankets. Especially extremely soft and warm blankets! I am pleased to show you the softest blanket that I have ever owned and it’s from Saranoni. Saranoni is company that sells blankets for every person in the family. They have blankets for your baby, toddler, young child, teen, and you! These blankets are surely the most soft blankets I have ever owned! 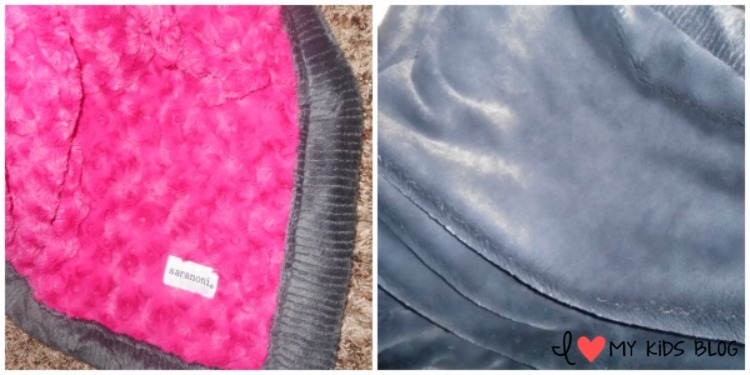 All of their blankets have super soft fabric on both sides. The cool thing about it is that the blankets are made with their own special fabric straight from the thread. I chose to get a toddler-to-teen blanket for my daughter. The size of the blanket is 40×60. It’s the perfect blanket for your toddler who just outgrew their favorite blanket. 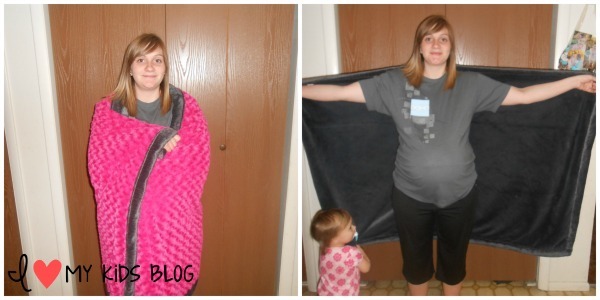 I was able to wrap this blanket around my pregnant body! I can even use this if I wanted to. It’s not the ideal size for an adult. They do have adult size throw blankets that are 60×80 inches. My daughter loves this blanket so much, in the picture above she is saying “MY BLANKET!” as she forcibly tries to take it from me. 🙂 She wasn’t too happy that I took her blanket even if it was just for a quick moment. We chose to get the swiril/lush blanket in hot pink/charcoal color. If you look in the picture above you’ll see the different materials. Both sides are soft as I said before. The pink side is swirl and the charcoal gray side is lush. I don’t think you could choose which side you like better. They are both so soft that it doesn’t even matter what side your wrapped up in! My daughter can’t get enough of this blanket! She could cuddle this all day if I’d let her! Saranoni sells the toddler-to-teen blanket for $62. It seems expensive, but once you see the quality of the blanket, you will not regret it. I am saving up to buy an adult throw for myself! If you are wanting a nice warm blanket I suggest Saranoni’s blankets to anyone! 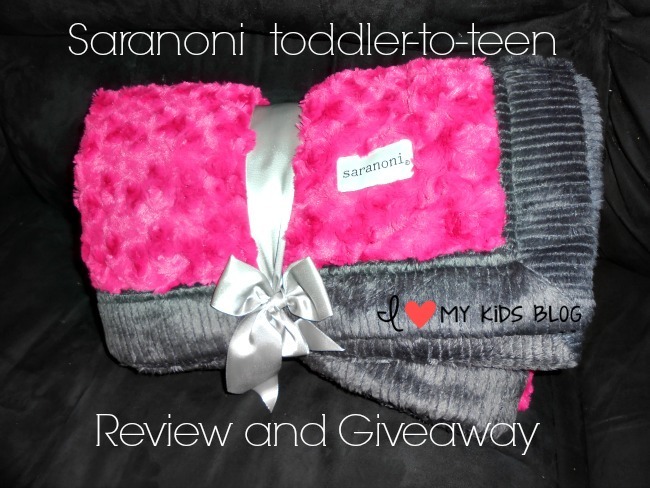 Saranoni is offering to giveaway a toddler-to-teen blanket of your choice! All you need to do to enter is fill out the Rafflecopter form from the link below! This giveaway end at 11:59 pm est on 4/22/14. Giveaway is complete! Congrats to our random winner: Sarah Desilets Littlefield! Congrats Sarah! You have been emailed and have 24 hours to reply or a new winner will be chosen! Thanks to all who entered and don’t forget to check out all of the super soft blankets available on Saranoni! I think I would choose the Teal Swirl/Chocolate Lush. I love the ivory swirl/ gingersnap lush!! I would choose the Aqua Lush/Gray Lush. I love the look, this blanket looks so soft & comfy, I would love to win it and I would snuggle up with my hubby with it Thanks for the chance! My favorite one was the one up above but also loved Leopard Lush/Leopard Lush! I like the Chocolate Swirl/Gingersnap Lush. I love the Leopard Lush/Leopard Lush and I would use it when I go into the hospital to have my baby. I love the Leopard Lush/Leopard Lush, and I would use it when I go into the hospital to have my baby. I would get the ivory swirl and gingersnap lush to keep in our living room for me and my daughter to snuggle with. I love the pink one, but I’d probably get the brown one for my son. He loves to cuddle with soft blankets. I love the Swirl/ Lush!! I’m sure both of the daughters would love to cuddle in this beautiful blanket with me! Love them all, but I would choose teal and chocolate lush. I would love one of these cuddly blankets! These look so cuddly. I would love one! I would love an aqua Bamboni to snuggle my grandchildren in when they come to my house! I LOOOOVE the Cherry Blossom Swirl/Chocolate Lush and would use it to cuddle up with my kiddos during movie night! I would love one. It would be nice to watch tv,and cuddle with the kids. Love the look and texture. i would cuddle with my two boys! Chocolate lush/Gingersnap looks cool. This would be N awesome cuddle blanket, looks so soft! Chocolate lush/Gingersnap looks cool. This would be an awesome cuddle blanket, looks so soft! Chocolate lush Gingersnap looks cool. This would be an awesome cuddle blanket, looks so soft! I would like to win my three year old, soon to be four in June, daughter the light pink swirl/gray lush blanket. I would choose the Light Blue Swirl/Navy Lush for my nephew. Then again, these blankets look like heaven and as much as I love him, he’d probably have to fight me for it!! I would get the Lavender Swirl/Chocolate Lush. I would probably give this to my teen daughter. I would choose the Lush/Lush in Candy Apple/Charcoal and it would be for my seven year old grandson to snuggle in! I would get the Chocolate / Gingersnap Swirl for me. The Hot Pink Swirl/Chocolate Lush and I would give it to my little girl. I would love to snuggle with my grandson in the Chocolate & Buff Stripe Wild.. I would wrap my little kids in the blanket, while we watched movies. Sunshine Wave/Gray Wave looks like a good neutral baby choice! The Lime Green Lush/Silver Lush blanket would look good cuddling my granddaughter, Nellie. I would choose the light blue swirl/navy lush. My son would cuddle with this wonderful blanket. Thanks so much for the opportunity to win. I like the Hot Pink Swirl/Charcoal Lush and this would be for my dd! I would get the Light Blue Swirl/Chocolate Lush. I have a new grandson coming and this would be a good gift that will last for years! I love the Gingersnap Lush. I would probably use it myself mostly. I really love the Leopard Lush/Leopard Lush! I would choose the light blue lush/gray lush! Pink & Grey Lush! I really love this blanket and have several favorites! I just found out my daughter is pregnant for the first time so I would give it to her! Thanks for this awesome giveaway! I think the blanket is sweet and would love one for my grands. Light Blue Swirl/Chocolate Lush. My Grandsons would be cuddled in this gorgeous blanket! My grandson is outgrowing his blankets and this would be a great size to wrap him in. I would love a swirl lush. It looks so foxy and comfortable. My Kidd would steal it fir themselves cause they love extremely soft things. Hot pink & chocolate. This would be great for my daughter!!!! Chocolate/Gingersnap-for my nephew,my lil buddy. I would like to snuggle up with my 2 year old daughter in the Leopard Lush toddler to teen blanket. Spring green swirl/Gingersnap lush. So pretty! I would love to have the chocolate swirl/gingersnap lush for my son. He loves super soft blankets. I love the Spring Green Swirl/Gingersnap Lush. And I would totally keep this for myself if I won. My kids have all “Claimed” (Walking Dead Style) all the throw blankets on the couches. This one would be mine! Oh I really love the Teal Swirl/Chocolate Lush!!! I would choose Aqua Bamboni. My fav is the Lilac Wild/Plum Lush. I would love to get the lavender swirl/violet lush blanket to snuggle with my baby girl! I would get either Bambini or lush/lush in charcoal! I would choose lush/lush in gingersnap. I love the candy apple red/grey. I would give it to my daughter who is due in July. If I won, I’d choose Teal Swirl / Chocolate Lush. It would be for our granddaughter. I would choose the Lavender Swirl/Chocolate Lush. I really love the Cherry Blossom Pink Lush. Thank you for the chance to win! I would get the Charcoal Bamboni for my son. He is thirteen and he has always loved soft blankets. 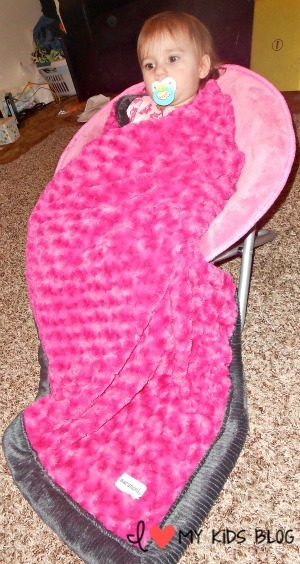 My little girl would love to cuddle in a pink blanket just like the one shown. I would choose the teal or aqua one with the gray charcoal lush for my son. The Teal Swirl/Chocolate Lush blanket is beautiful! Would love it in that color if I win! i would love the Chocolate Swirl/Gingersnap Lush if i win. I like the Chocolate & Buff Stripe Wild Toddler to Teen Blanket. I would love the Teal Swirl/Chocolate Lush! my granddaughter has one of these blankets but a small one..i would love one for myself they are so soft..
I’d probably end up getting the candy apple lush/ charcoal lush. My 8 year old would most likely get it (only because he’s a blanket stealer) And Lush/lush would be awesome! I’d choose the light blue and gray lush for my new grandson! OMG! My daughter would love this! She would take any of the colors and styles! but pink is her favorite color! I like Candy Apple/Charcoal, but I would let the kids and my husband decide. It would be mainly for my youngest, but my girls would share. Love the pink and grey! My 3 girls would so fight over this. I like the green one in the picture on the first page but there may be another I like…my phone wouldnt let me see them all. My upcoming baby would be the owner of this soft blankee! Hot pink/charcoal wave lush for my daughter the blanket hog. Hot pink/charcoal wave lush for my daughter the blanket hog. She uses blankets as a cover for cold weather instead of a jacket. Hot pink/charcoal wave lush for my daughter, the blanket hog. She uses blankets as a cover for cold weather instead of a jacket. Hot pink/charcoal wave for my daughter, the blanket hog. She uses blankets as a cover for cold weather instead of a jacket.